^ Whitaker, Brian. Battle station. The Guardian (London). 7 February 2003 [26 August 2011]. ^ Sec. of State Hillary Clinton: Al Jazeera is ‘Real News’, U.S. Losing ‘Information War’. ABC. 2011-03-02. （原始内容存档于2017-03-01）. ^ A decade of growth. 半岛电视台英语频道. ^ 半岛电视台被指歪曲叙局势 多名记者辞职. 環球網. 2012-03-16. ^ Mohamed Hassan Shaban. 22 resign from Al-Jazeera Egypt in protest over bias. Asharq Al-Awsat. 2013-07-10 [2013-07-11]. ^ Jessica Chasmar. 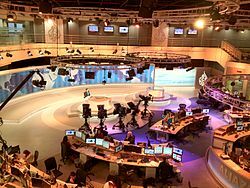 ‘We aired lies’: Al-Jazeera staff quit over biased Egypt coverage. The Washington Times. 2013-07-09 [2013-07-11]. ^ Robert F. Worth. Egypt Is Arena for Influence of Arab Rivals. The New York Times. 2013-07-10 [2013-07-11]. ^ 卡塔尔召回驻埃及大使 称埃代表指其支持恐怖行为. 中新網. 2015-02-19. ^ 外交封鎖戰：沙烏地、阿聯、巴林、葉門與埃及，對卡達「同步斷交」. 聯合新聞網 / 轉角國際. 2017-06-05.